Paula Fleri-Soler interviews Peter Sant, co-writer/director of Baħar Żmien (Of Time and the Sea). In Baħar Żmien, an old man (Narcy Calamatta) suffering from dementia dreams he was once a king. He lives a frugal and solitary life with his two daughters (Ruth Borg and Mandy Mifsud) after surviving a bizarre malady of mysterious origin on an island devoid of animal life. Eerie and stunning, oftentimes challenging, but always compelling, Baħar Żmien is an example of Maltese filmmaking which proves that taking risks and thinking out of the box can reap rewards. There are shades of many things Shakespearean about Baħar Żmien – most obviously a King Lear-esque type in the demented old man at the heart of the story and the volatile relationship with his daughters; and touches of The Tempest with its island setting, while the old man is certainly a Prospero-like character, wielding his sorcery on his subjects. Was Shakespeare a direct influence at all? Yes, the Shakespearean influence is certainly there. Another example is the king’s fear of the Grigal, which is taken directly from Hamlet, “only mad in the north-north [wind]”. In fact, the work is fraught with literary references, such as the lead female role stemming from St Augustine’s Confessions and the king’s ailment, along with the poisoned land, coming from Arthurian legend, the Fisher King. Baħar Żmien was largely informed by the landscape. I stumbled across the exterior location a while back and was amazed by what was there – dry-stone walls everywhere, all arranged in strange megalithic type configurations. No one we spoke to seemed to know for certain what the walls were used for so we (Alex Vella Gera, co-writer, and I) decided to create our own imagined history that is quite naturally a culmination of our own seperate influences, be they from literature, painting, film or anywhere. It is fair to say that the islands of First, Second and Third are a ‘bizarro-land’ post-apocalyptic version of Malta – what inspired this setting? A lot of my work stems from my interest in how Malta is presented as a location double designed to attract large film productions as a financially preferable alternative to the real thing, such as Rome (Gladiator) and Tel Aviv (Munich), so in a sense, it’s an eternal elsewhere. I wanted to continue this tradition by keeping the characters nameless and presenting the islands simply as First, Second and Third, and use the props and sets that have been left behind from these productions to create an eclectic array of temporally disparate references. This idea began very early in the scriptwriting stage when I visited the film studios at Fort Ricasoli. I was impressed by how its baroque architecture was strewn with fake Roman, Egyptian and Greek antiquities, like artefacts from our colonial forefathers, but made of cheap wood and plaster. Many aspects of the story are ominously analogous to current world affairs… There is the obsessive building of a wall and the looming presence of a Chinese businessman, while a palpable sense of helplessness permeates the proceedings. How consciously are you making a statement on the condition of the world today? For the most part this was intentional – yet although the part in the film where the king demands that his youngest daughter build an enclosing stone wall to protect them from the returning malady may seem like a direct comment on the US/Mexican border issue, it was, in fact, written before there was any mention of it. The inclusion of the Chinese billionaire is, however, a direct reference to the emerging Chinese middle-class, African land grabs and global power struggles. Also, the inhabitants live off the king’s sacred faeces, which in turn is the cause of the cyclical malady. This speaks for itself – we’re all subject to the consequences of the decisions of those managers on the top floor. The notion of ‘helplessness’ is, to me, underpinned by a sense of absence. This is most pertinent in the lack of a mother figure in the family. Then there’s the absence of identity which refers to what I mentioned earlier about this ‘eternal elsewhere’. That said, the main protagonist of the film is not any of the characters themselves but the land they inhabit – we hoped to reflect on how the human experience is conditioned by the spaces we inhabit. With the overdevelopment that persists across Malta this is certainly something that should not be ignored. You made an obvious casting choice in Narcy Calamatta and a brilliant one in up-and-comer Ruth Borg in the main roles. Tell us more about them both and how they adapted to this unusual and powerful drama. I had the good fortune of working with Maltese casting director Francesca Briffa. Francesca showed a real understanding of the project and is so passionate about what she does, both at the development stage and even now in the work’s dissemination, which is incredible. Narcy is, well… Narcy I guess (anyone who knows him knows exactly what I mean!) He went to great lengths in his preparation for the role. I first met him a year before the production and then recall visiting him just prior to the shoot, having not seen him for a few months. I was taken aback by how he had physically transformed himself for the part. He had, in my eyes, already become the character. He also has an immediate presence on screen, which is so rare. The same can be said for Ruth. We auditioned quite a few people for the role but with her it was just something so miniscule – a simple gaze that told me she was the right choice. I must say all three members of the on-screen family (including Mandy Mifsud as the eldest daughter) naturally gelled into one complete unit. You have said: “I don’t set out to make films with stories, not to say I don’t like them, but I prefer to work in a less direct way that’s more open to interpretation.” What do you hope audiences take away from the film? Baħar Żmien was designed as an experiential film from the word go. I’ve always preferred films where the viewer plays an active role, evaluating and interpreting what’s seen and what is not seen; what’s heard and what’s not. Through this, my hope is that everyone who watches it walks away with their own interpretation; there is no wrong or right. Alex Vella Gera and I wrote the script in the hope of maintaining a kind of oneiric tone, with things unfolding as would a memory, and therefore destabilising the linearity and avoiding the more conventional ‘and then’ cause and effect logic where everything is graspable and simply took time to unfold. After spending five years in art school you’re left with a hostility toward narrative – which in itself is stupid because there’s so much to be explored within the narrative framework. There definitely is a narrative buried in Baħar Żmien – it just happens not to sit as high up on the pedestal as it does in most films. There’s a cyclical notion running throughout the film, with the mantra, the microwave, the fact what the characters do is played back to the auxiliaries in the cinema. So, with this in mind, the narrative had to remain open-ended and embrace the impossibility of fixing the unresolved past or indeed the influx future, just like it is for the characters in the film. 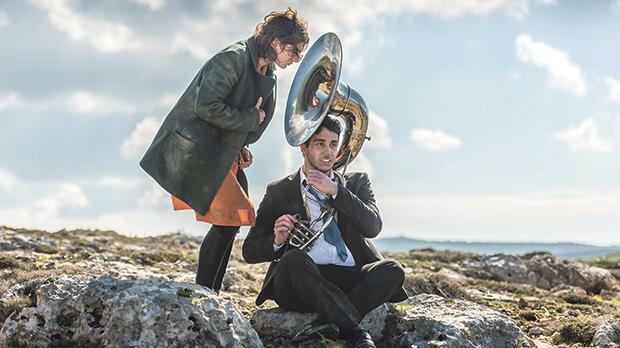 It is gratifying to see films like Baħar Żmien – a highly experimental, thought-provoking, often abstract and niche piece – forming part of the Maltese film calendar. What would you say about the current state of the Maltese film industry? Maltese cinema is still fairly non-existent. To date there are only a handful of films out there, nowhere near enough to have yet established a unique voice. I guess this is not only due to quantity but also because there is no real established film school to speak of. I’m not generally in favour of film schools but you can’t deny that many defining eras in cinema started with a group of students or other similar institutional settings, such as Dogma and New German Cinema. Given the interconnectivity, advances in communication and resources these days you could argue that such a thing isn’t even possible anymore. I will answer this again in a hundred years’ time when there’s more to talk about (hopefully). Right now, I’m concentrating on a series of shorter films. I imagine it ending up as around eight to 10 films of around three to four minutes each – a bit like a pop album. The films are about intangible things like the memory of cinema, the wind, nothingness and more; and are primarily dialogue-driven pieces. I’m also currently recording and arranging an audio piece for cinema which is kind of the opposite of a silent movie, meaning there is no image, only sound. Baħar Żmien is supported by the Malta Film Fund.